When playing tennis, you will ned a good tennis racquet. One that hopefully has the proper size and weight and of course, the proper string tension. Racquet manufacturers don't really vary in price so much, unless you are one of those individuals who likes to purchase the latest model racquet. In that case you will always pay the highest price for your tennis gear. Once you find a racquet that you like, it is probably a good idea to purchase a spare one that is the exact model. I currently order my tennis gear including tennis shorts through Fromuth Tennis, which ONLY sells to tennis teaching professionals and/or pro shops. 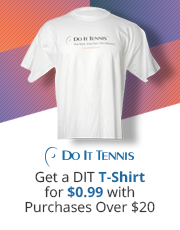 If you would like the best prices on tennis gear and equipment, visit our proshop affiliate and then fill out the form on this page with the item number and I will let you know how much the item will cost. Tennis racquets have come a long way since I first began playing. Today's racquets are ligher weight, and have significantly more power than twenty years ago. the technologies that are used today require better technique. You will find a wider assortment of tennis equipment. From tennis racquets, to tennis bags, to tennis clothing, there is something there for everyone. To have your racquet restrung click Here. Probably one of the most overlooked parts of a person's tennis gear while playing tennis is the footwear. Most people just go and purchase any pair of athletic shoes and go out and play. This can be a crucial mistake for your safety. Because not all shoes are created equal. Running shoes especially, cannot take the constant stop and go motion and certainly not the side to side twisting that playing tennis requires. I would almost rather see an individual come out with a pair of high top basketball tennis shoes than a pair of high quality running shoes. However, basketball sheakers are not always the most stylish shoes to look at for today's player. Today's tennis shoes are not only more stylish, they last a lot longer that in previous years. What I like to do even though I am not playing competitively anymore is, I like to purchase two pairs of shoes. The shoes that I purchase usually come with a 6 month wearout warranty. What this means is that the manufacturer will replace the shoe if you wear out the sole within six months. They will, however, only replace that particular pair one time.